The very word brings dread to most people. Failure, of all types, is something we all try to avoid. It is practically wired into us. Some people don't want to fail so much that they try nothing at all. Yet we have to try things. We may fail in the beginning, but eventually, we learn and succeed. Now, hold that thought for a moment. Failures happen in fiction all the time. I mean A LOT. Heroes, and their friends and sidekicks, stumble through the first parts of their quest. The heroes lose the first fight of the episode. Nobody gets the object of their affection on the first try. 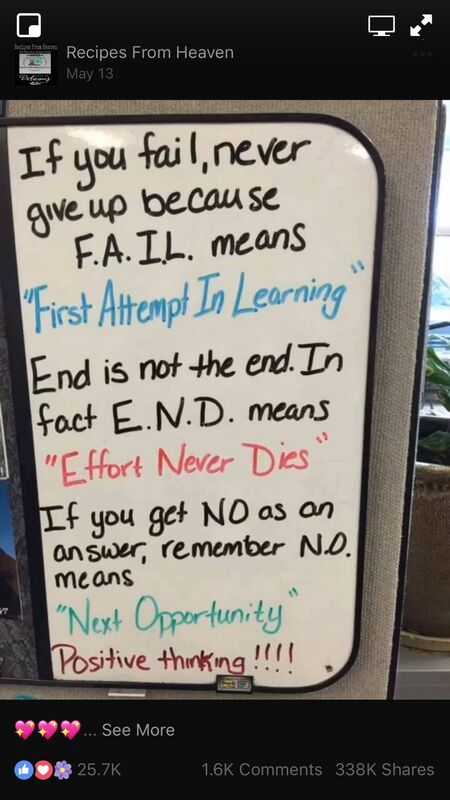 Yes, technically they all fail. But really, they suffer setbacks. We say failure, but they are really setbacks. This is a mental change that is important. Some would say it is a matter of semantics; others would say it is a change of viewpoint. A True Failure stops you (the person striving) from succeeding. It is a dead stop. Unless something radical changes in the situation, you can not try again. A failure means you did not succeed, but you might succeed if you try again or take a new approach. A setback is a failure that does not defeat you, but illuminates the problem (showing you a way that will solve the problem or won't). You eventually learn to overcome the setback/ problem. The fiction realm loves the setbacks, usually three of them (one major and two minors) set in specific spots in the story. It makes the goal seem worth it because the character had to overcome these obstacles. Most of these fictional cases these are not true failures, but simply setbacks. The character treats the failures as mere setbacks. A set back simply is an additional complication on the character' reaching their desired goal. For many who are bold in an undertaking, failure/setback is just a matter of point of view. Ask any Entrepreneur, Inventor, or Military Leader. As a GM, you want your characters to fail to some degree. Some players go in a straight line to the main event - their goal. Then, they wonder why they "lose". It is often too great a challenge for the hero in the beginning - if ti was worth doing in the first place. There should be events along the way. In a good story line, some of them are stepping stones to the "main event"/ their goal. They are challenges that bring the goal closer. Some of them will be too tough or must be approached in a different way. Again, setbacks to learn new things and the way to overcome. Some of the events are just events. But the outcomes are the same. What happens when someone fails or suffers a setback? They learn. New ways. New ideas. New Tactics. Characters in a game? What happens when they suffer a fail/ setbacks? Their players learn those new options, new ways, new combinations, and new ideas. They may even improve their game play. Their characters learn - experience points or skill checks or something. They develop skills, ranks, levels, new gifts/ feats, more points in abilities or powers. Given enough time and effort, a character will "learn"/ advance enough to take on that main challenge. So players should embrace their character's failures... learn from them and use them. Why is three the magic number? It isn’t. Read a dozen books, the number will vary. Notice how many times a character fails and then notice your reaction. 5+= does this guy ever learn?= reader annoyance. This number only includes failures that are part of a character's personal arc. This does not include main plots for the chronicle. Why? Usually, the failure at the inciting incident was not a result of planning. It is an involuntary, desperate response. Readers expect the character to fail here. (Players are of varying opinion on this point... some should never fail others "get it".) The Main Plot is a group set. Note: The reason why our characters should have flaws and built in problems? It is something that makes them more interesting and gives you things to roleplay. That aside, it gives the GM something direct to set in front of your character/ to be the challenges set in front of them... to give them things to fail from. A note of GM Management for a player: The more you can give a GM for plots and things, the less work the GM has to do. The GM will most likely follow your directions because they know you like it and it is less work for them. After all, an overworked or uninspired GM is a GM that can casually (or accidentally) throw far worse things to the character. A character who never fails is a character who never learns. It makes for boring fiction. It also means lower experience rewards because nothing is a challenge. Failure is progress, Letting characters fail or at least suffer setbacks gives them opportunities to grow (and earn xps).